rotecting wetlands is supposed to be the job of the Army Corps of Engineers and the Environmental Protection Agency. Here in Pamlico County, those two federal agencies may be looking the other way when it comes to 251 acres of wetland near Merritt. By not taking any action, they could set up a precedent for ignoring a much bigger piece of property with wetlands. Last fall, Oriental realtor Allen Propst brought attention to the 251 acres of wetland forest which had been scraped clear, just off of Trent Road in Merritt. It’s part of the same property owner’s 4600-acre Atlas Tract on Straight Road and the Florence-Whortonsville Road. A year ago, public outcry prompted a federal investigation by EPA. This fall, Propst finds that the federal agencies are sitting back and not enforcing the law. There is, however, another way to get the laws enforced. That’s where citizens and the Pamlico County Commissioners come in. Allen Propst explains it here. 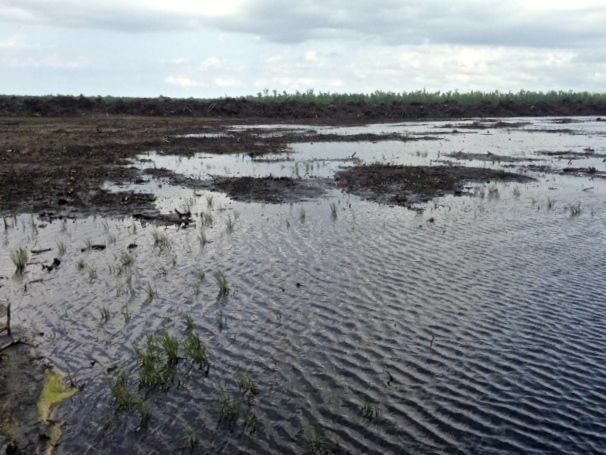 The Environmental Protection Agency announced two weeks ago that they were not going to bring an enforcement action against Spring Creek Farms LLC for altering 251 acres of wetlands that are directly adjacent to the headwaters of Trent Creek. Some of the 251 acres off Trent Road with standing water after a rain. Allen Propst says the land is wetland even if the owners cleared it last year. EPA’s Water Protection Director determined that ditches on the property were draining wetland, a violation of federal law. Yet EPA’s not requiring the wetlands be restored nor is it enforcing the law in any way on this tract. The NC Coastal Federation is poised to file a citizens enforcement action to get the law enforced. In that April letter, obtained by the NC Coastal Federation through the Freedom of Information Act, EPA’s Director of the Water Protection Division, James D. Giattina wrote, “The EPA and the Corps found that the forestry ditches on the Atlas Tract appeared to remove wetland hydrology on two of the sites we sampled (i.e., the 251-acre site and one of the wetland areas off Florence Road).” They were draining the land. So there you have it. EPA found a violation and wrote as much to Mr. King. Unfortunately, Mr. King had died on September 17, 2009 and as you might deduce, was not the registered agent for Spring Creek Farms LLC, which is owned by an agribusiness in Illinois. Sending a cease and desist letter to a dead man may provide a grim grin, I’ll confess. But the issues contained in that letter are very much alive. By its own investigation, EPA found what appeared to be a violation of the Clean Water Act and the subsequent Swampbusters Provision of the 1985 Food Security Act. These laws basically say it’s illegal to go in to a wetland or wetland forest and alter its hydrology – in other words, you can’t ditch & drain wetlands and wetland woods to turn them in to (higher priced) land for farming or development. So, here’s the question that should be on the minds of anyone who cares about how important wetlands are for our waters.. If EPA found that violation, why isn’t it pressing Spring Creek Farms to fill in those ditches and restore the wetlands? If earlier this year EPA saw fit to write to a dead man, why isn’t it protecting the wetlands for those of us living in Pamlico County? Wetlands living up to their name. Part of the Atlas Tract area is a 251 acre tract that was cleared as if for a farm field last summer. 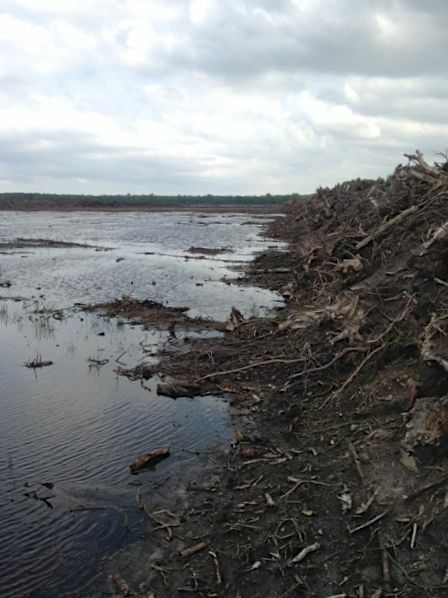 EPA determined the clearing was an attempt to change it from wetland to upland, an illegal action. But so far EPA has not ordered the owners to restore the wetlands. The NC Coastal Federation wants EPA to enforce the law and is ready to file a citizens enforcement action against the EPA if it doesn’t. The only plausible explanation that I can think of is that the EPA is opening up a “legal liability” umbrella and holding it over the U.S. Army Corps of Engineers, in other words, protecting another federal agency for its shoddy work. In the summer of 2013, the Corps of Engineers had given Spring Creek Farms, LLC what’s called a “Non-Jurisdictional Letter.” That meant that the Corps decided it didn’t have jurisdiction over the land because the Corps (erroneously) assumed it was not wetland. As I wrote a year ago, the Corps didn’t do its homework. It just took the word of the land management group working for Spring Creek Farms LLC, which, in its application for that “Non-Jurisdictional Letter” claimed that the 251-acre site had not been altered by ditching. The property had ditches on it before Spring Creek Farms LLC bought it in 2013, but aerial photos going back many years prove that the ditches were not there when the federal policy on saving wetlands took hold. The ditches were put in sometime in the 1990’s, after the Swampbuster Provision became law in 1985. That makes them illegal no matter who owns the land. But because of bad information and lack of due diligence by the Corps of Engineers, Spring Creek Farms LLC had the piece of paper it needed. The Illinois agribusiness then spent thousands of dollars clearing the 251 acres last year, and ditching it even more, presumably to convert it. The problem with that equation is that allows further environmental degradation to occur in the waters of Trent Creek and the larger Pamlico Sound. That’s something the Corps – and the EPA – should be preventing. The Pamlico County Commissioners wrote letters about their concerns over the environmental alterations of the Atlas Tract to the Corps of Engineers on November 5, 2013, and then to the EPA on April 8 of this year. The Corps responded with a brief letter on December 20, 2013 saying it was “working closely with the EPA to gather additional information to assist in reviewing the determination of jurisdiction.” The EPA, to my knowledge, has never responded to the County Commissioners. 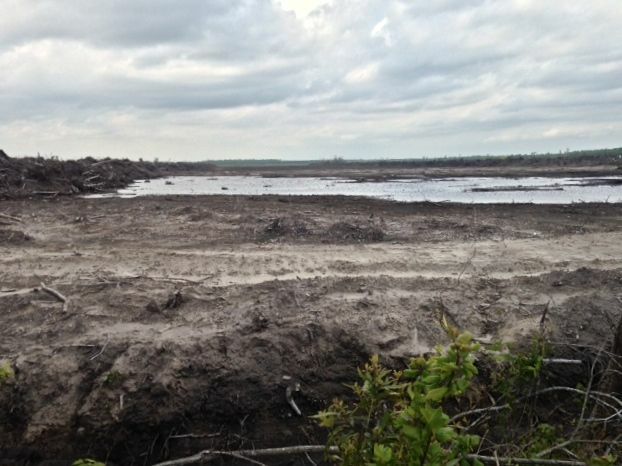 Water ponds up at the site of the cleared 251 acres. The EPA earlier this year said it appeared the clearing had “removed the hydrology” (that is, changed it from being a wetland). That is illegal, yet EPA is not taking any enforcement action such as forcing the draining ditches to be filled in. The NC Coastal Federation and Southern Environmental Law Center are poised to file a citizens enforcement action. They’re asking the Pamlico County Commission to join in on that. And now we learn that while the EPA found reason to send a cease and desist letter in April, it won’t back that up with any enforcement action now. If I were to guess, EPA worries that if it takes action against Spring Creek Farms, the company will then sue the Corps for giving it the go-ahead. By not trying to enforce the law, EPA is in effect holding a “liability umbrella” over the Corps to shield it from such a lawsuit. In that scenario, we lose. Since the EPA won’t enforce the law on its own, the Southern Environmental Law Center in Chapel Hill and the NC Coastal Federation in Cape Carteret are preparing to file a 60 day notice with intent to bring a citizens enforcement action against the EPA. It would call on the Environmental Protection Agency to fully enforce the Clean Water Act and the Swampbusters Provision of the Food Security Act of 1985 regarding this 251 acre portion of the Atlas Tract. This is where you come in. In order to have clear standing in Federal court and be successful in this legal action, the Law Center and Coastal Federation need to have the Pamlico County Commissioners pass a resolution and put their names on this citizens enforcement action, as well. Some here might argue that these 251 acres are only a small portion of the 4,658 acre Atlas Tract, so why go to the trouble? Here are two reasons why. First, these 251 acres are, in my opinion, the most environmentally sensitive portion of the Atlas Tract because they are directly adjacent to the headwaters of Trent Creek. If the EPA lets these 251 acres be converted to agricultural land, this valuable estuary will be inundated with fresh water contaminated with nitrates, pesticides, herbicides and sedimentation that will lower fisheries productivity forever. Secondly, there’s the precedent. If a citizens enforcement action is not brought against the EPA on this portion of the Atlas Tract, the EPA may be reluctant to bring an enforcement action against Spring Creek Farms LLC on the remainder of the Atlas Tract. They may get the message that Pamlico County doesn’t care. The Pamlico County Commissioners will be meeting on Monday, November 17 and discussing a motion to join the Southern Environmental Law Center and the Coastal Federation in this citizens enforcement action letter to the EPA. The SELC and the Coastal Federation are paying for the legal action against the EPA; the County provides the standing. Please contact your commissioners beforehand. And please plan to attend this very important meeting and voice your opinion – or just show up to show your support – in protecting not only 251 acres of sensitive wetlands but all wetlands that play such a big part in the health of coastal estuaries in Pamlico County and all of Eastern North Carolina. Todd Miller, N.C. Coastal Federation, toddm@nccoast.org, Cell: 252-242-0191, 252-393-8185 (work), 252-393-7508 (Fax). Derb Carter, Southern Environmental Law Center, derb@selcnc.org, 919-967-1450 (work). 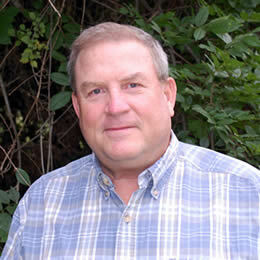 Travis Graves, Neuse Riverkeepers Foundation, 252-621-8261 (cell), 252-637-7972 (work). To download and read EPA’s April 2014 cease and desist letter, click here.